The latest issue of Weekly Famitsu reveals that Demon Gaze II launches on the PS Vita in Japan in fall 2016. The scale of the story has greatly increased compared to its prequel. Demon Gaze II is set in the city-state of Asteria which is surrounded by the ocean. Due to the success of the inn-tavern Stella’s Place, the former small city was able to grow rapidly. Signa and others who were raised in an orphanage have formed a party of revolutionists to search for their disappeared mother. Signa is the new “Demon Gazer” in Demon Gaze II and has the power of the “evil eye” which he obtained after an abduction in exchange for his memories. Muse, the manager of Stella’s Place and also Signa’s childhood friend, joins the revolutionary party as its young leader. Muse’s younger sister Prim works as a singer in Stella’s Place. 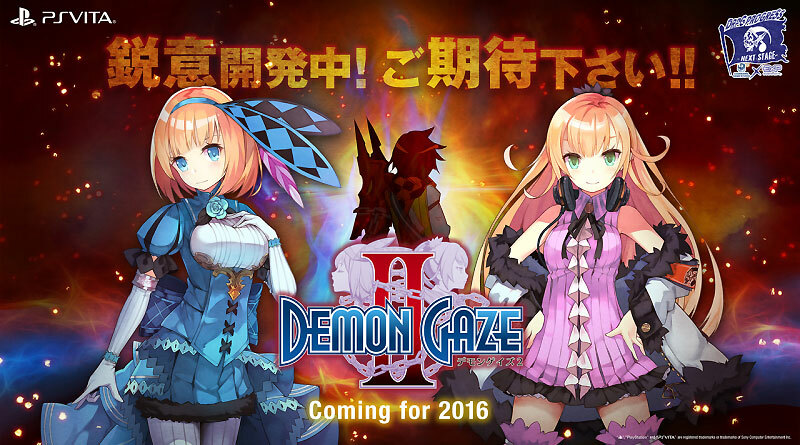 Demon Gaze characters Prometh and Cassel Glondike will return in Demon Gaze II. Several years have passed since the first Demon Gaze and a new generation of demons has surfaced. The new demons are named after constellations and can appear in the form of humans and demons. By combining the Demon Gazer with power, new battle styles can be unlocked. New categories of demons like songstresses will also be available. Popular features from the first game like hunting circles and auto-pilot will return in Demon Gaze II.